Everyone knows catnip as the plant that makes cats go crazy. For us, it actually has the opposite effect and is one of my favorite herbs for a night-time tea. It gently relieves “congestion” affecting the nerves and has a sedative effect on the nervous system. It is also a good cure for diarrhea. 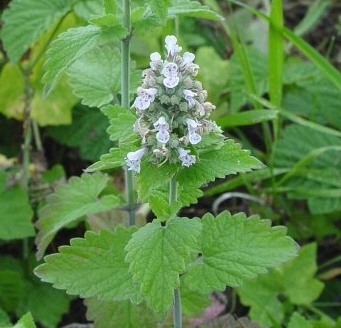 Due to its mild, gentle nature, catnip, like lemon balm, is excellent to give for nervousness and hyperactivity of children as well as a a tea to relieve fevers and colds. Catnip (like lemon balm and tulsi) makes a great glycerine to give to children. Catnip also combines well in equal parts for a tea of catnip, chamomile, spearmint and lemon balm. We use the leaf and flowers for tinctures and teas. Catnip also makes a nice infused honey. Disclaimer: The information on this page has not been approved by the FDA. Please consult your healthcare practitioner before using herbal products. We do not endorse the websites linked in the resources and have not extensively reviewed all the information on external pages for accuracy. Everyone reacts differently to herbs and we do not attempt to be completely inclusive in the information and contraindications for each herb.